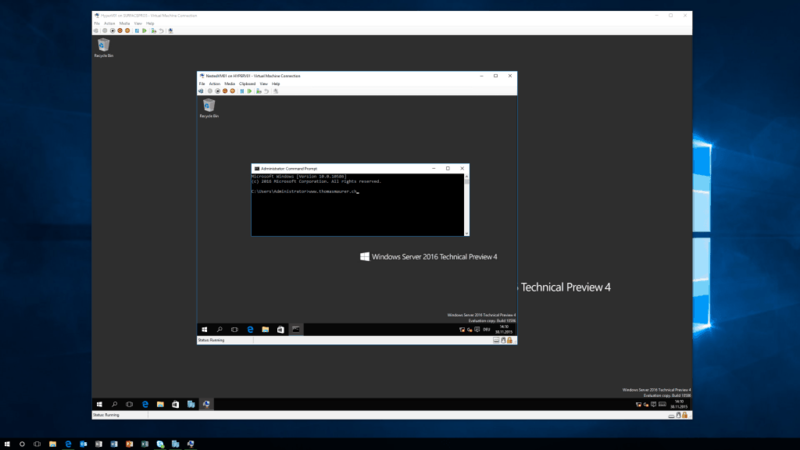 I already wrote a blog post bout Nested Virtualization in Windows 10 some weeks ago. With Technical Preview 4 of Windows Server 2016 Microsoft also introduced Nested Virtualization in Windows Server Hyper-V. Nested Virtualization allows you to run a Hypervisor inside a Virtual Machine running on a Hypervisor. This is a great case for demo and lab environment and also if you want to run Virtual Hyper-V servers in Microsoft Azure IaaS Virtual Machines (we will see if Microsoft will support this in Azure in the future). At least 4 GB RAM available for the virtualized Hyper-V host. To run at least Windows Server 2016 Technical Preview 4 or Windows 10 build 10565 on both the physical Hyper-V host and the virtualized host. Running the same build in both the physical and virtualized environments generally improves performance. A processor with Intel VT-x (nested virtualization is available only for Intel processors at this time). Once nested virtualization is enabled in a virtual machine, the following features are no longer compatible with that VM. Hosts with Device Guard enabled cannot expose virtualization extensions to guests. For more information check out the Microsoft page about Hyper-V Nested Virtualization. Is there a way to enable the virtualization flag on the host again too? I have installed HyperV on Windows 10 Pro and Server 2016 TP5 in an virtual Machine. I then installed the HyperV Features via Powershell on the Server 2016. Somehow i can’t run another virtual machine on Server 2016 Hyper V.
When i try to start the nested VM i got an error, that some HyperV Service is not running. (I already run the powershel script you noticed on the nested vm on win 10 page, and i run the set-vmprocessor command, but no success.